atmosphere of this style of jazz. Traver, and bassist Joan Marti. a la exploración del jazz y sus afines, había descubierto al guitarrista Django Reinhardt. gracias a sus propias composiciones y arreglos. scatt, Josep Traver, guitarra rítmica y Joan Marti, contrabajo, voice y scatt. tanto a americanos, como al resto del mundo, hablamos de Django Reinhardt. el cual forma parte del archivo nacional holandés como disco histórico. Jaco Abel • Big John Patton, etc. de jazz inglesa Jazz Rag otoño 2002.
el mundo por sus guitarras. festivals in the United States, Mexico and Europe. month and broadcoasted all over the United States. 2004 and Blue Drag 2004.
like Jimmy Rosenberg, Angelo Debarre, John larsen, Walter Malosetti, etc. Avantgarde music all over the world. spiritual force and enormous musical power struck him. Ives, Olivier Messiaen, Bela Bartok. His passion for the music and the composition is his life. album Adoracion (gospel record) in Florida, USA. station (Holland) around the world. times in 2 years by Catalunya Radio. was broadcast on short wave by Hilversum radio station (Holland) around the world. In 1993 plays with Joe Gallivan at the Cova del Drac, Barcelona. (Cecil Taylor enjoy de concert as an special guest). In 2000 plays at RADIO UNAM, México city with Roberto Aymes trio. His string Quartet nº 2 is performed by “ EL cuarteto de la ciudad de México”, in México City. England with a tremendous success. 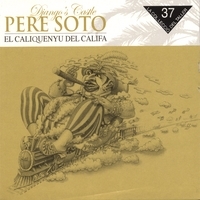 In 2002 several festival in spain and radio TV programs with Django’s Castle. Marta Saenz. Fiestas de Huajupan. Assistant arranger and scoring on the Tina Marsh project: “Courage of the Butterfly”. Club of France and Pere Soto originals in the Django tradition as well as standards. Soto is steeped in Djangology, but his own compositions are anything but derivative. Ramon Punti and Josep Traver. leader de la formation, y exprime encore son admiration pour le génial manouche. l'ombre de Larry Corryell (le fameux disque "Young Django"
l'aventure "Django's Castle", un des rares groupes de ce style en Espagne. partir de cette "base" un langage personnel et tout à fait réjouissant." omplir una hora i mitja de bon concert,"
desconocido por estos predios, goza de enorme consideración en los Paises Bajos. as a leader in his native musical sound." long, clean lyrically turned solos. ...is replete with small virtues and sense of craftsmanship. búsqueda que no parece tener final. sound reminiscent of John Scofield. At times, he uses distortion effectively. whenever he can, As a composer there’s problably no one else like him. -Jazz Festival Terrassa 82-84-86-92 "as headliners)"